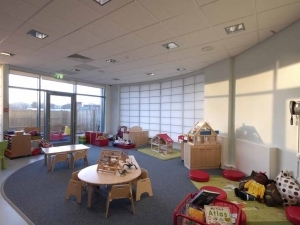 The nursery is built within the new South Lanarkshire College Campus with its own dedicated entrance. The nursery accommodates 55 children from ages 6 weeks to 5 years. Each department has direct access to outdoor play areas which are equipped with a variety of apparatus allowing outdoor learning to take place. HB were fully involved in all new mechanical and electrical services.